Text-to-911 is now available in Franklin County. If you need help, but can’t safely speak on the phone or are unable to speak, use your mobile phone to send a text message to 911. You are deaf, hard of hearing, or have a speech disability. You are in a situation where it’s not safe to call 911 for help. You are having an medical problem and cannot speak on the phone. If you’re driving, pull over when it’s safe. Do not text and drive! Q: What kind of phone or phone service do I need to be able to text to 911? Any text-enabled phone or tablet with a data service plan that allows texts will work, regardless of service provider. Q: Where is text-to-911 available? Text-to-911 is available throughout Franklin County. The only other Central Ohio jurisdiction able to receive texts to 911 is Delaware county. Elsewhere in the state or country, the service is very limited. Q: If I text-to-911, will the dispatcher know my location? No. Be sure to provide your location and the nature of your emergency when you text. Q: Can I text in another language or just English? Emergency dispatchers use translation services to understand phone calls in different languages. These services are not currently available for texts. Q: Do emergency texts receive priority? No. They are treated like any other text message, and subject to the same possible delays, reliance on signal strength, etcetera. Q: Can I text a picture or video? No. Emergency dispatchers cannot right now receive pictures, video, or emojis via text. Likewise, they cannot receive messages that are part of a group text chain or with more than one recipient. Q: Can I text police for a non-emergency inquiry? No. 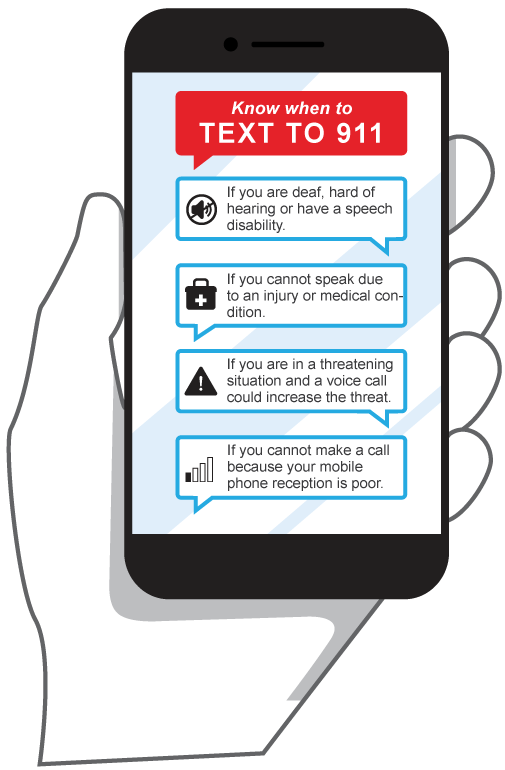 Text-to-911, like calling 911 on the phone is reserved for emergencies only.